It wasn't meant to be overheard. Private luncheon conversations among world leaders, picked up by a microphone, provided a rare window into both banter and substance — including President Bush cursing Hezbollah's attacks against Israel. Mr. Bush expressed his frustration with the United Nations and his disgust with the militant Islamic group and its backers in Syria as he talked to British Prime Minister Tony Blair during the closing lunch at the Group of Eight summit. "See the irony is that what they need to do is get Syria to get Hezbollah to stop doing this sh*t and it's over," Mr. Bush told Blair as he chewed on a buttered roll. CBS News senior White House correspondent Bill Plante reports Mr. Bush also told Blair that he expects Secretary of State Condoleezza Rice to go to the Middle East soon. The president also bluntly expressed his frustration with U.N. Secretary-General Kofi Annan, telling Blair, "I felt like telling Kofi to get on the phone and call (Syrian President Bashar) Assad to make something happen." CBS News chief White House correspondent Jim Axelrod says the open microphone only made public the reality that had been emerging in private: the lack of agreement on the best way to stop the violence in the Mideast is raising tensions among the leaders who are trying to come up with a plan. The open mic caught Mr. Bush chatting with Russian President Vladimir Putin and expressing amazement that it will take Putin and an unidentified leader just as long to fly home to Moscow as it will take him to fly back to Washington. Putin's reply could not be heard. "You eight hours? Me, too. Russia's a big country and you're a big country. Takes him eight hours to fly home. Not Coke, diet Coke. ... Russia's big and so is China. Yo Blair, what're you doing? Are you leaving?" Mr. Bush said. The president thanked Blair for a gift of a sweater and joked that he knew Blair had picked it out personally. "Absolutely," Blair responded, with a laugh. 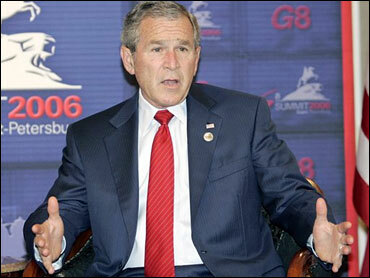 Mr. Bush, a stickler for keeping to his schedule, could also be heard saying, "We have to keep this thing moving. I have to leave at 2:15. They want me out of here to free up their security forces." Mr. Bush also told a staffer that he didn't need speech notes. "No, I'm just going to make it up as I go along," Mr. Bush said. "Some of these guys talk too long." This wasn't Mr. Bush's first awkward live mike moment. During the 2000 campaign for president against Al Gore, Bush took a look around at a stop in Naperville, Illinois, and spotted a New York reporter he didn't like. "There's Adam Clymer — major-league a------ from the New York Times," Mr. Bush grumbled. "Yeah, big time," replied Cheney, in an exchange neither man appeared to intend for public consumption, although that's exactly where the words wound up.